Gerald Campion became a Television star in the 1950's at the age of 29...playing the role of a schoolboy. 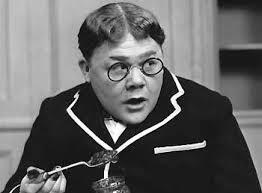 From 1953 to 1961 Campion was Greyfriars most famous pupil in the series Billy Bunter. An unlikely choice when you consider that he was 5ft 5in tall and weighed only 11 stone, having just been on a diet. However, producer Joy Harrington had auditioned numerous actors for the part without success, until Campion showed up. "I took one look and realised he had Bunter's face," she later stated. However, critics of the day were unconvinced on the show's first screening (each episode was performed live - twice, once for the kids and two hour later for the adults), with the Daily Sketch being particularly damning, brandishing the episode "Dull, Dated and Boring." The following day the newspaper was deluged with complaints by parents and children alike, who loved the programme -and in a complete turnaround the Sketch printed every letter in support of Billy Bunter. Fame for Campion came at a price and the actor complained of having to open endless fetes and pie factories. He couldn't even go into a sweet shop without fathers thrusting children in front of him saying "There son, that's Billy Bunter!" His creation of Bunter overshadowed any other role he undertook even though he made numerous other appearances in Minder, The World of Beachcomber, Sherlock Holmes and Doctor Who. Film appearances included bit parts in Half a Sixpence and Chitty Chitty Bang Bang. In 1956 Campion opened The Key Club near the London Palladium and eventually Gerry's in Shaftsbury Avenue, which became a famous meeting place for actors. Later in life he became a notable restaurateur running award-winning establishments in London and Kent. "I suppose it's fitting that a man who played Billy Bunter should end up in the Good Food Guide," he said. Campion, who was 81 years of age passed away on July 9, 2002 and was survived by his wife of 40 years, Susan, as well as three children from his first marriage.